NEW YORK - August 31 - Farm Sanctuary, the nation’s leading farm animal protection organization, welcomed 30 chickens to its shelter on Saturday, the animals taking refuge from the horrors of New York City’s live markets. Live markets proliferate in the city’s five boroughs; nearly 175 are open for business. At these markets, customers select from chickens, goats, cows, sheep and turkeys, who are then killed on the premises. Many of the animals are kept in filthy conditions and visibly ill.
Four of the chickens brought to Farm Sanctuary’s New York Shelter were found abandoned in a vacant lot near a Brooklyn market. Given the high volume of animals coming and going from the businesses, escapes are common and birds can be found wandering nearby streets. Most of the remaining birds are “spent” layer hens, discarded from the egg factory farming industry when their production dropped off. 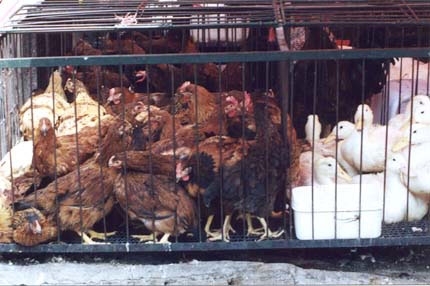 New York City’s live markets are frequent destinations for spent hens, who arrive near death and are sold for a few dollars. Upon their arrival, the 30 chickens were given medical attention. The birds were covered in lice, had overgrown nails and some had injuries to their wings and feet. One will most likely lose a wing due to an infection left untreated. The chickens will eventually be integrated into the New York Shelter’s main flock. Comment: These live markets, found worldwide, most notably in China, are absolute nightmares for the wide assortment of animals, birds, and fish that are for sale for human consumption. Wherever there’s a market you’ll find animal welfare violations, public health risks, and environmental concerns. Take action – contact wildlife officials in your area, the health department, the FDA, all levels of government, and spread the word to help stop this barbarism. 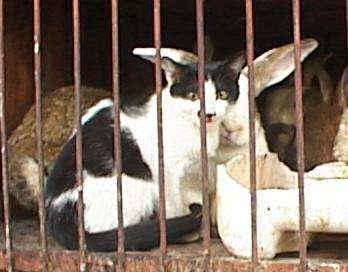 BOYCOTT LIVE ANIMAL MARKETS! Dogs rescued from illegal Taiwanese meat factory brought to B.C. VICTORIA — In her four years of life, Vixen has seen a lifetime of horror. The chubby Siberian husky, now in foster care in Duncan, B.C., was being fattened up as a Taiwanese dinner delicacy when she was rescued from an illegal meat factory by an extreme group of Taiwan-based animal rescuers known as the Compassionate Mamas. "It's hard to look at her and think they were going to eat her," said Gem Zolciak founder of Island Dogz Rescue, who is fostering Vixen. The dog already has lost almost three kilograms and is now a relatively svelte 25 kilograms (55 pounds). Her hips and back are slowly recovering strength after being kept in a small cage. Vixen is among three dogs brought to Vancouver Island from Taiwan by Island Dogz this month. They represent the first shipment from Taichung Universal Animal Protection Association, a no-kill shelter that takes in stray and abandoned dogs, including those rescued from meat factories. At the shelter, six volunteers care for more than 1,000 dogs. Eating dogs and cats has been discouraged in Taiwan for two decades. A 2001 law banned the killing of dogs for skin or meat. Legal loopholes were then closed by a 2004 law banning the sale of dogs as food, but underground markets still exist. The laws are rarely enforced, said a spokeswoman for the Taichung group. Some dogs are "farmed." 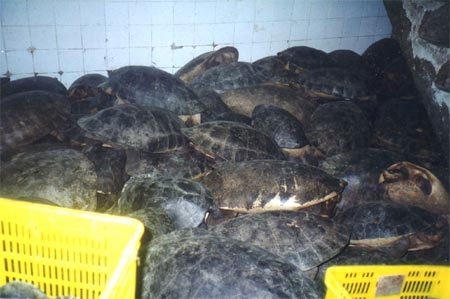 Others are snatched off the street and stuffed into tiny cages until they are killed. "Some people feel the adrenalin coursing through the body makes the meat taste better and the dogs are tortured before they are killed," Zolciak said. Taichung group volunteer Johanna Quinn, who arranges dog shipments to rescue organizations in Canada, the U.S and Germany, said the Compassionate Mamas go on random, nighttime raids when they hear of a factory and then turn the dogs over to rescue organizations. Others go in undercover and buy the dogs, Quinn said. In addition to Vixen, Mooch, a nine-year-old malamute cross, and Heidi, a nine-month-old mixed- breed puppy, are in foster care in the Cowichan Valley, 40 kilometres north of Victoria. "I could bring 100 dogs here if I had the foster homes. We foster them before we adopt them out so we can assess their personalities," Zolciak said. Dogs brought to Vancouver Island are checked by veterinarians and fully immunized. They are shipped from Taiwan in crates with canine amenities, usually accompanied by a human caregiver. The Province’s web story on dogs rescued from an illegal Taiwanese meat factory and their subsequent arrival in B.C. attracted a mixed response from readers. The love of dogs as pets competes with attempts to understand the differences between cultures. - Saying that every culture should be allowed to eat what it likes is the easy way out. As a citizen of this world and an animal lover someone has to patrol these things or there will be no dolphins, no turtles, no elephants etc. We don't need to eat everything that moves. - All animals killed in abattoirs are tortured so there's really no difference. In 2008, 3.25 million cows, over 110,000 horses and 170,000 + lambs and sheep, over 680 million chickens, ducks, geese and turkeys were slaughtered in Canada. A further 23.8 million pigs, including those shipped live for slaughter elsewhere were also "produced." It may be cultural, but it's still an insane amount of carnage. How much of that ends up on your plate or in Rover's puppy chow? - Hats off to Compassionate Mamas. I have seen on the internet how these animals are tortured before they are killed and it is a vulgar, barbaric, and disgusting spectacle. The people that do this are the lowest form of life on this planet and they are not welcome here. Having said that it is not a lot different than our seal hunt. Comment: If there is such a thing as karma then the human race should be very worried about it's future. Cruelty in the name of culture or any other excuse is both offensive and intolerable. If you have concerns over live animals being sold in your community please take a bit of time to contact local officials and animal advocacy groups. Each of us can make a difference. In May 2011, the Heart of the City's Farmer's Market in San Francisco, California, banned the sale of live birds. A victory, after years of campaigning by animal welfare organizations and individuals who maintained that in addition to involving cruelty to animals, live bird sales posed a potential health hazard for people.